The 30th Annual Kelly’s St. Patrick’s Day Parade is set for Sunday, March 17, 2019, at 1 p.m. The restaurant may be closed but the parade must go on! 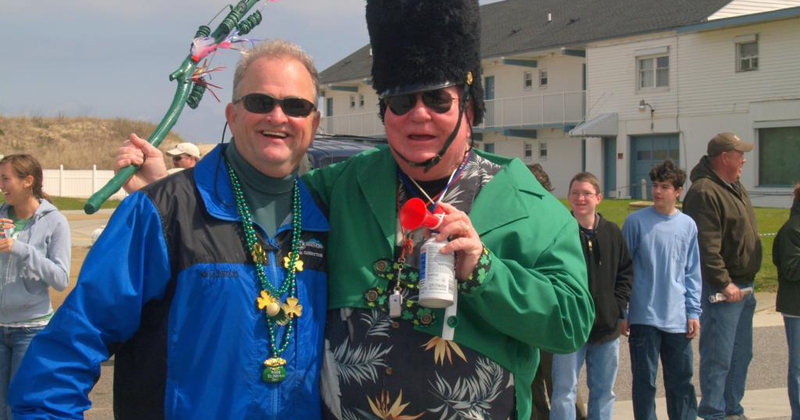 The “Grand Poobah Ernie Bridgers” – Kelly’s 30th Annual St. Patrick’s Parade kicks off on Sunday March 17th at 1 pm in Nags Head. This year’s theme is “Red, White and Blue…. with a splash of Green!” to celebrate American patriotism and Irish-American heritage. The Parade will also honor the memory of South Nags Head White Trash (SNHWT) Grand Poobah Ernie Bridgers. Ernie passed away last year and was an integral part of the parade for many years leading the SNHWT Beach Chair Drill Team and Kazoo Band. The group was a parade crowd favorite, winning the award for Best Overall seven years in a row. SNHWT Queenie Marie Bridgers and others from the group will lead the parade. All are invited to join in! The one-mile parade route runs from Bladen St. (MP 11.5) north to Driftwood St. on Virginia Dare Trail (Beach Rd.). An esteemed panel of judges will score entrants on the use of the parade theme in the following categories: Best Overall; Best Float; Best Unit; and Best Band/Music group. Prizes will be awarded following the parade. To participate as a parade entrant, an application will need to be submitted. Parade applications can be downloaded from kellysrestaurant.com and are available for pick-up at Mako’s Beach Bar + Grille in Kill Devil Hills. Contact Parade Director Mary Ann Newman at kellysobxcatering@gmail.com or (252) 441-4116 to have an application sent to you or to volunteer along the parade route. What began as a way to break up the winter doldrums and to invigorate the community in preparation for the summer season, the parade has grown to include over one-hundred entrants and viewed by over eight thousand attendees thus making it the largest St. Patrick’s Parade in North Carolina! See you on March 17th in your red, white and blue …….and GREEN!